Jesus Christ sent the Apostles out to the whole world with the words, "Go and teach all nations (Mt 28:19)". In obedience to his instruction, the Apostles set off for different parts of the world as it was then known. St. Peter preached the Gospel in Rome as well as other places. It is there that after his death, a certain manner of celebrating the liturgy based on Roman culture and the Latin language developed over time. It is known as the Roman (Latin) rite. According to tradition, St. Peter's older brother, Saint Andrew, brought the light of the Christian faith to the Greeks. The ancient Greek culture formed the basis on which the Greek rite (also known as Byzantine) developed over time. During the first millennium Christianity spread throughout Europe by means of both these rites. (Outside of Europe other rites also evolved, e.g., the Coptic in Egypt, the Ethiopian in Ethiopia, the Syrian and Chaldean in the Middle East, the Armenian among Armenians, etc.). In spite of the diversity of rites between the Roman and the Eastern Church, the Church remained united throughout the first millennium. The Bishop of Rome, Saint Peter's successor (the Pope) had the role of overseeing the bonds of love uniting the Churches. One should bear in mind that many Popes were of Greek origin. The first Slavic nation to embrace Christianity was the Great Principality of Moravia. Saints Cyril and Methodius began their mission in Moravia in the year 863, thus becoming the Apostles of the Slavic nations. They came from a Greek - Slavic family in Thessalonika and belonged to the Greek clergy. They invented an alphabet for the Slavic language, and translated Greek liturgical books and Sacred Scripture into Slavic. (Shortly after the death of Cyril and Methodius, the Slavs adopted another version of the alphabet which they named "Cyrillic" in honour of St. Cyril.) In the year 68 the Bishop of Rome, Hadrian II, ratified the usage of the Slavonic language in the liturgy and consecrated Methodius the first Archbishop of the Slavs. From then on Europeans could proclaim the praises of God in the liturgy by means of three different launguages: Greek, Latin and Slavonic. The beginning of the second millennium was marked by a fracture within the European Christian family. In 1054, unity in communion was broken between the Eastern (Byzantine) and Western (Latin) Church. Two independent (foreign to each other) centres of ecclesial authority evolved, one in Rome, the other in Constantinopole. From this time onward the term, "Orthodox" was used to denote Christianity linked with Constantinopole, and the term, "Roman Catholic" for that linked with Rome. Before that time the names "Orthodox" (i. e., faithful to the truth) and Catholic (i.e., universal) where considered complementary and could be used interchangeably. Several centuries later efforts were made in an attempt to re - establish unity between Constantinopole and Rome. In Latin the word "unio" signifies unity. Thus the community of the Greek (Byzantine) rite, which adopted reunion with the See of Rome, was called the "Uniate" Church. Within the territory of the Republic of "Obojga Narodow" -- (Poland was at the time composed of two nations: the "Crown," which was the root of the Polish nation, and the "Grand Duchy of Lithuania," which was inhabited by a Russian population) --Russian and Roman Catholic Bishops came to an agreementre - establishing Church unity. This reunification was signed in 1596 at Brest in Lithuania (now Byelorus). In modern day Poland, the Ukrainian Greek Catholic Church and the neo - Uniate parish of Kostomloty are the living legacy of this Brest Union. The Ukrainian Greek Catholic diocese based in Przemysl includes over 100 parishes, both within traditionally Greek Catholic territory (land which was under Austrian rule during the Partition of Poland) and in northern and western areas of Poland where Greek Catholics were resettled by Communist authorities during the Vistula repression after 1947. This Union was later abolished by the Czar in that area of partitioned Poland which came under his dominion. But later on still, between the two world wars, the Union was renewed in the Podlaska and Chelm area; hence the term neo - Uniate. Out of the 10 parishes which existed before World War II within present day boundaries of Poland, only one at Kostomloty on the Bug River (20 kms from Brest) survived the Communist regime. 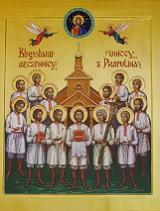 Today it is the Shrine of Podlasie Uniates. The village of Kostomloty is recorded in historical documents dating back to 1412 when Prince Witold of Lithuania (brother of Wladyslaw Jagiello) paid for the foundation of an Augustinian monastery in Brest. The parish of Kostomloty was established in 1631, thus later than the Brest Union. 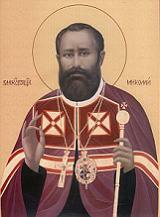 The precious icon of the Church's patron St. Nikita (who died in 370 A.D.) dates from this period. The Church is a classified monument which also dates back to this time, though it was enlarged in 1852. Among the more precious items are the icon of the Mother of God with child (Hodigitria) from the 17th century and the icon of Christ Pantocrator also from the 17th century. On the occasion of the 350th anniversary of the parish, major restaurations were undertaken. More recently, thanks to donations from friends and pilgrims the interior was repainted with polychrome tempera and the iconostasis was re-gilded with gold leaf. The Uniate parish of Kostomloty comes under the direct jurisdiction of the Primate of Poland. For spiritual matters the Bishop of Siedlce also shares jurisdiction. The parish has received the visit of its Ordinaries: the Servant of God Cardinal Stefan Wyszynski as well as His Eminence Joseph Cardinal Glemp. Cardinal Henryk Gulbinowicz has also been among the many distinguished visitors there. Since 1969 to 2007 the parish has been administered by the Congregation of Marians (Rev. Roman Pietka MIC). The Uniate Parish of Kostomloty has recently been established as the Shrine of the Podlasie Uniates. Each year approximately 70,000 pilgrims honouring the Uniate movement come to the Shrine. Associated with the parish is also an Ecumenical Centre which is a place for hosting retreats for groups of young people from Poland and elsewhere. During the summer months about 250 people take part in ecumenical retreats and evangelical sessions conducted by the Centre. During the last few years groups from the Czech Republic, Slovakia, Estonia, Latvia, Russia and Byelorus (Catholics, Evangelicals and Orthodox) have taken part in these retreats. Sometimes there have even been some participarts from as far away as France, Ireland, Germany, Malta etc. At the Shrine of the Podlasie Uniates and the Ecumenical Centre, pilgrims and participants in retreats meet with unbiased information about Eastern Christianity and the universal Church in the diversity of liturgical traditions. At Kostomloty polemical discussions are avoided. The pastoral direction is concerned with presenting Orthodoxy in an accurate and positive manner. The Kostomloty parish maintains a warm, though unofficial, contact with Orthodox brothers and sisters.